Amanda is a recent Economy Return. This is her second round of bad luck. She was returned by another family in 2010 for the same reason. 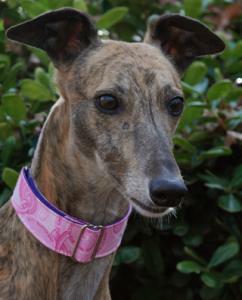 Amanda is a tiny, sweet brindle girl that turned 8 on Christmas day. Her sire is the famous Castor Troy and her dam is CC's Debbie Lynn. She is a smaller girl that raced at 58lbs. Amanda lived with children and a small dog in previous homes so would do fine in a home with either.Â She also passed her cat test. Amanda is sweet, loving and very friendly. She loves to snuggle and rest her head in your lap. She is calm and has been perfectly behaved in in her foster home. We think she would make a nice Therapy Dog because she has such a calm, quiet, but friendly personality and is so well behaved. Amanda is a star at our meet and greets. Her foster mom always dresses her up in fancy collars, coats, bling and occasionally even a hat. Amanda loves it and loves the attention she gets when she is all dressed up. She is so beautiful and looks SO young without much white on her face. No one would dream that she is 8 years old.Â Because she is 8 years old she qualifies for our reduced senior adoption fee of $200. Thanks to CrazyCollars for donating another $75 towards Amanda's adoption fee which brings her total adoption fee to only $125!